It comes as a surprise to think that customizable restaurant food is still considered a relatively new trend. After all, it wasn’t until the late 1970s that the salad bar was finally introduced to Utahns, which is now so ingrained in our culture that it’s hard to imagine a time when they didn’t exist. 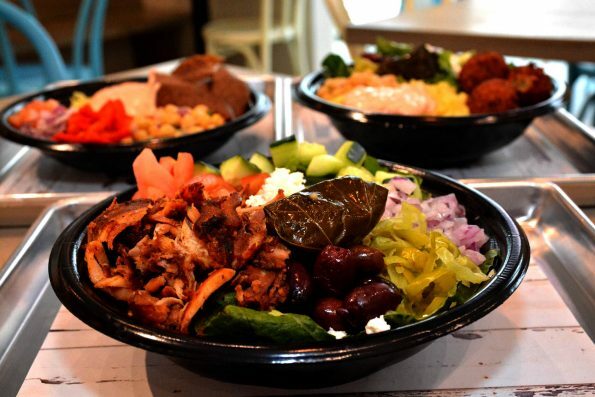 In the last decade, however, salad bar-style eateries have popped up all over the state, and the Paulous family—owners of the Greek Souvlaki chain, decided to capitalize on the trending business model. Greek Souvlaki first opened in 1972, introducing Utah to the little-known gyro. Started by a young Greek couple, Lee and Mary Paulos, the establishment gained popularity and has expanded to several locations across the Wasatch Front, including a notable stop at the Salt Lake International Airport. After their father’s retirement nearly 15 years ago, Chris, along with older brothers Frank and Leo, wanted a new concept for a restaurant after noticing the popularity of customizable dining such as Cafe Rio and Chipotle. Their solution was Padeli’s Street Greek. Named for their father, whose name is Padeli in Greek, the restaurant is a cafeteria-style concept that allows diners to pick-and-choose what they want in their gyro or souvlaki. Similar to a salad bar, behind-the-counter workers prepare the meals based on customers’ requests. Now retired, Lee Paulos still makes regular visits to the stores, often being spotted on a patio, sipping a cup of coffee, watching the fruits of his labor continue to grow. “We are currently looking to expand beyond our single Padeli’s location,” Chris adds. As they continue to grow their business, the Paulos’ plan to keep the business within the family.